Home ⎢One for all or all for one? One for all or all for one? What are the differences between the self-sufficiency and team diving approaches to technical diving? One of the most contentious issues amongst technical divers is the difference between the self-sufficiency and team diving approaches to diving. Like a number of other issues in technical diving, it seems to polarise opinions, often along agency boundaries. This often leads to exaggerated positions that can take on a similarity to religious fundamentalism. The self-sufficiency mindset is where the diver is fully self-sufficient and approaches the dive with the view that they can perform the dive on their own and would be fully able to complete the dive without a buddy. The approach is summed up by the mindset that if you can’t do the dive on your own then you should not be doing the dive at all. The other approach is team diving where strong team work and cooperation are the focus of the dive, and you plan to dive with a team of divers, and the team works as a well coordinated whole. These two approaches seem to have a very different emphasis, and many divers think that they are contradictory. That is, you have to decide whether you have a self-sufficient approach or a team-based approach and that it is a choice of one or the other. Both approaches have their extremists who will go to great lengths to explain why their approach is right and the other approach is wrong. 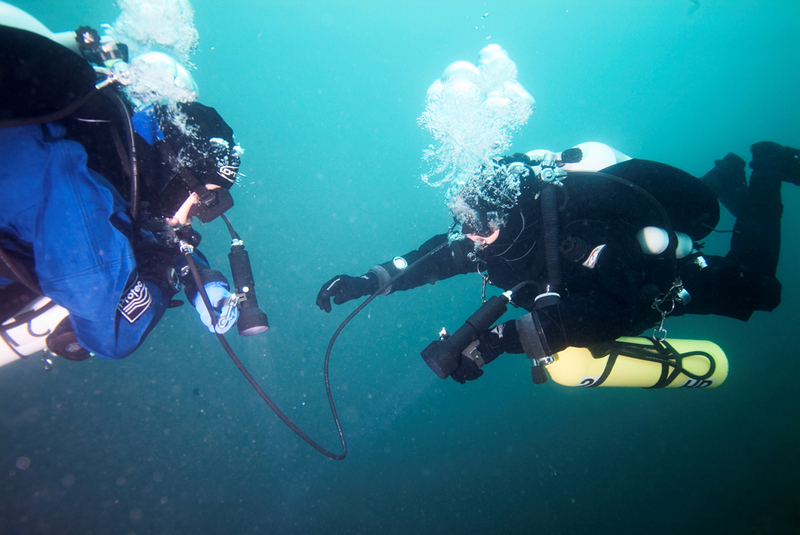 In some areas, technical diving in the United Kingdom has evolved into a culture of solo diving where many experienced technical divers dive solo. All equipment choices are made on the basis that you will be diving alone or that your buddy will be of no use. Gas planning is based on the principle that it is impossible or unlikely that your buddy will be any use in an emergency and so all procedures are based on individual action. The team diving approach also has its extremists who focus on teamwork as the primary goal and consider self-sufficiency to be a sign of weak teamwork. These divers will only dive with divers who follow the exact same team procedures. ↪Click here to download pdf (right-click to save). You may share IMAGE and LINK to pdf but please leave pdf in place. Sorb Storage: New research released!